HEp2 cells are held dear in autoimmune diagnostics. They are invaluable for people engaged in analysing autoantibodies, as E. coli is for molecular biologists or mice for toxicologists. In spite of a wide range of other suitable methods and technologies, determination of autoantibodies with indirect immuno-fluorescence assays (IFA) on human epithelioma (HEp2) cells still contributes significantly to the diagnosis of autoimmune diseases. The widely recognised advantages of this method are high sensitivity and a broad spectrum of antibodies that can be analysed simultaneously. 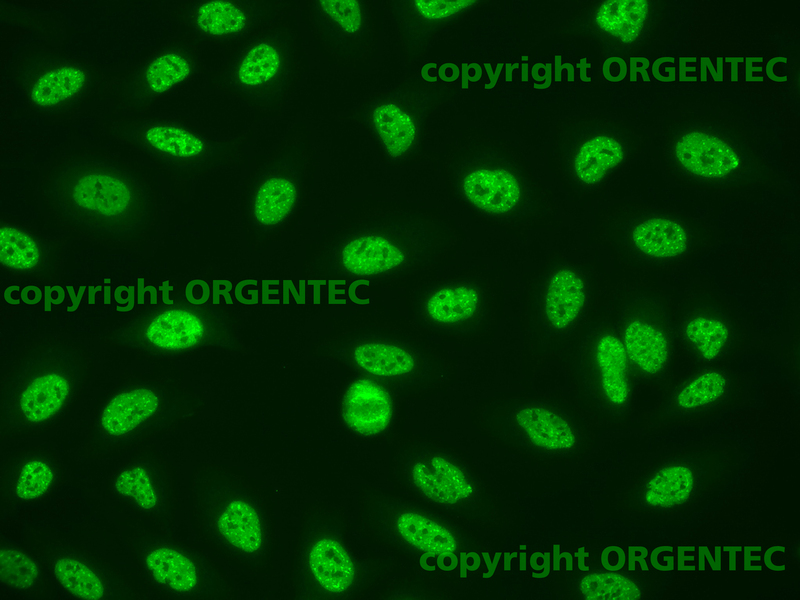 In addition to mere detection of antibodies a characteristic fluorescence pattern and staining of metaphase and cytoplasmic cells offer supplementary information. When an autoimmune disease is suspected, the HEp-2 test usually is the first line test. Any positive result is then followed up by a step-wise diagnostic approach, including other immunological tests like ELISA (enzyme-linked immunosorbent assay) for single antibody specificities or immunoblot tests. Biological materials like the HEp-2 cell line or complete tissue sections present the diagnostically relevant antigens in their natural surroundings; therefore, a variety of autoantibodies can be determined simultaneously and with high sensitivity. Detecting autoantibodies via immunofluorescence on HEp2 cells provides more information than a simple positive or negative signal. Many antibodies show characteristic fluorescence patterns, e.g. homogenous, granular, nucleolar, dotted, cytoplasmic, that allow for differentiation of several groups of autoantibodies (see table 1). 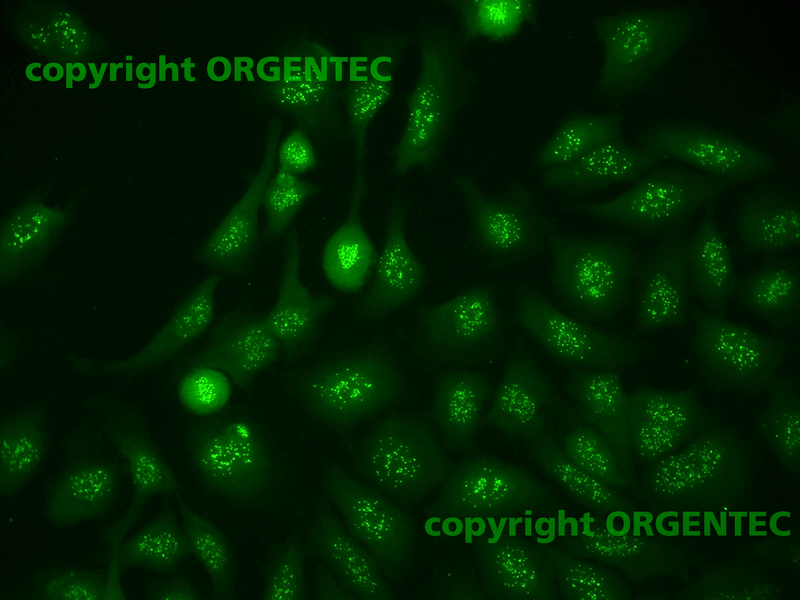 Antibodies against cell-cycle dependent antigens exhibit no immunofluorescence pattern on organ tissue sections. However, they may be of significance in the diagnosis of some autoimmune disorders. Because both the mitotic phase and the metaphase of the cell cycle are identifiable in HEp2 cells, information regarding the patterns of the chromosomes is also available. The table below gives an overview on the fluorescence patterns produced by autoantibodies directed to different cellular antigens. The ideal HEp2 cell, how should it look like? 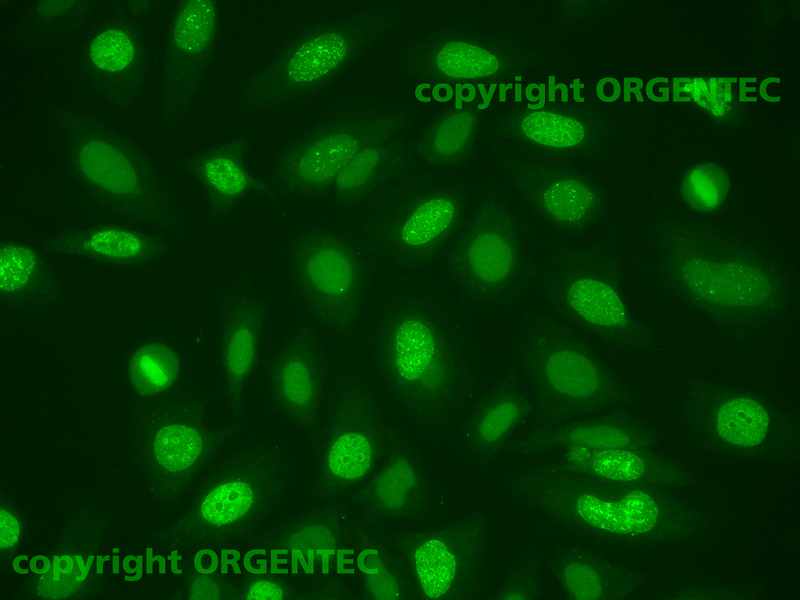 To confirm a specific positive immunofluorescence result on HEP2 cells, the cell nuclei must be clearly distinguished from the surrounding cytoplasm, and all cells must exhibit a definite fluorescence pattern. Describing this pattern includes careful examination of different cellular components. Are the nuclei glowing homogenously or do they show a granular or nucleolar pattern? The cytoplasm may appear fine or coarse speckled, and antibodies directed to the cytoskeleton may occur. Eventually, the chromosomes may be positive or negative. The cell nuclei have to be large and uniform in size. Broad cytoplasms with clearly definable antibody patterns and definite discrimination of the cell nucleus are required. A considerable number of cells should be in different phases of the cell cycle. A limited number of chromosomes (<10) should be clearly visible. Two to six chromosomes of which one to three are in metaphase is the optimum. Testing for ANA is of special importance for the diagnosis of many rheumatic autoimmune diseases, like systemic lupus erythematosus or Sjoegren’s syndrome. Laboratory tests are helpful in differential diagnosis and for verification of the clinical diagnosis. 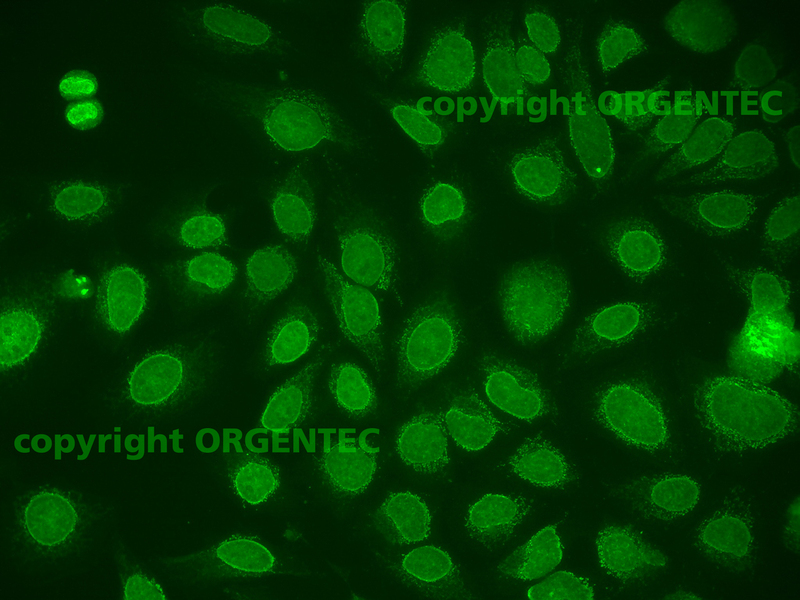 Indirect immunofluorescence assay of ANA on HEp-2 cells is considered the gold standard for their screening. Due to the large number of different antigens presented by the HEp2 cell substrate, the test is highly sensitive, but for the same reason specificity is limited. The ANA test on HEp2 cells is frequently positive in a considerable number of non-autoimmune subjects. In order to identify features that discriminate positive ANA-HEp-2 tests in autoimmune patients from positive tests in non-autoimmune subjects the authors of a Brazilian study compared the results of ANA determinations in healthy individuals with those of patients suffering from different rheumatic diseases . Mariz et al performed their analysis particularly with regard to the ANA titre and the fluorescence patterns. They found elevated ANA titres in about 13 % of the healthy individuals. In the blood of these people titres generally tended to be low (< 1:80 in 87 % of the control group). In contrast, the majority (90 %) of the patients had high ANA tires (≥ 1:80). For the most part, the non-autoimmune subjects exhibited a fine speckled fluorescence pattern with no staining of the chromosomes. Specific patterns (homogenous, centromere, dividing cells) only appeared in 4 % of the healthy individuals. ANA screening assays by IFA are time consuming, subjective and laborious. Many attempts have been made to find a reliable substitution. A promising study compared the results of 2000 consecutive sera with requests for an ANA in a routine serology laboratory setting tested by an ELISA screening assay with multiple ANA specificities (ANA Detect from ORGENTEC) to those obtained by immunofluorescence. From these results, the authors established an ANA ratio cut-off protocol to guide further action, and assessed its efficacy in a second series of 7000 samples. Their results indicate that the ANA Detect ELISA can be an alternative to IIF for the detection of clinically significant antibodies . However, there are still some antibodies that are exclusively detectable by IIF. Replacement of standard immunofluorescence methods with bead-based assays for antinuclear antibody (ANA) testing is still under investigation. Bruner et al  analysed serum samples from 1540 SLE (systemic lupus erythematous) patients, 1154 unaffected relatives and 906 healthy controls with IIF, immunodiffusion and an automated bead based solid phase assay. The frequencies of ANA in the sera from African American, Hispanic, and European American patients with SLE were 89%, 73%, and 67%, respectively, in the bead-based assay and 94%, 84%, and 86%, respectively, by IIF. The frequencies of ANA detected by the bead-based assay are lower than those detected by IIF, especially in European American patients with SLE. Detecting ANA by IIF on HEp2 cells is superior to the automated assay and still remains the standard technique for the detection of ANA. Until today, antibody detection on HEp-2 cells is maintaining its central role. In cases with suspected autoimmune disease, the HEp-2 test is the recommended screening method, which allows for cost-effective and high-quality serological diagnosis of various autoimmune diseases. Any positive result is then followed up by a step-wise diagnosis in which, depending on the evaluation of the reactivity with HEp-2 cells, other substrates may be used or other immunological tests like ELISA (enzyme-linked immunosorbent assay) or immunoblot assays are carried out. It is the clearest explanation about HEp2 cells that I have found in the web.